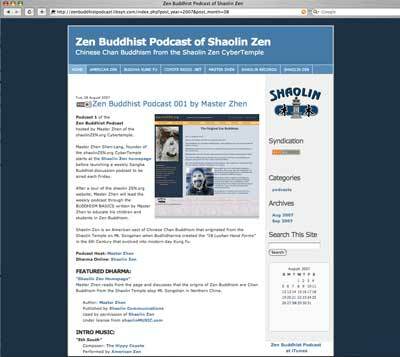 shaolinZEN.org is the CyberTemple founded by Buddha Zhen Shen-Lang, Spirit Wolf of Truth, who also founded the Tai Chi Youth Nonprofit Organization, and Shaolin Chi Mantis Traditional Buddhist Gongfu. Master Zhen strives to improve each student by developing their body with Yang Style Taijiquan, balance their minds with Zen Buddhism, while developing their inner energies and spiritual powers with Qigong, Yoga, and advanced energy flow meditation exercises founded by Bodhidharma at the Mt. Songshan Shaolin Chan Buddhist Monastery Temple in Northern China. Founded in 1984, Shaolin Communications is the book publisher and parent company of Shaolin Records and Shaolin Music. Shaolin Records began releasing vinyl records of its exclusive artists which still include The Hippy Coyote, who began releasing his record albums under the band name, American Zen, in 1991. These records and movie soundtracks, are now being released digitally on the internet, eliminating the need for record distributors who have taken advantaqe of, or limited the growth of this Southern California based independent record label (indie label). Record producer-founder, Richard Del Connor, was expanding his record company operations in 1991 with a half-dozen employees and interns before moving to Utah that year, which forced him to resume operations as a one-man enterprise. Shaolin Music is the music publisher company founded in 1984 by Richard Del Connor, that administrates all copyrights and artistic properties including the photography of The Coyote, Richard's pseudonym given to him by the Los Angeles journalists that heralded his rock opera, Coyote In A Graveyard. An A&R Vice President of MCA Records was hired by a Hollywood movie company, and one of his first projects was to acquire Richard's rock opera and have him rewrite it as a motion picture screenplay. Unfortuanately, before Michael J. Fox could commit to the movie project, the production company ceased it's theatrical releases to focus soley on television productions. Although this enabled other Hollywood producers such as Steven Spielberg, and Kathleen Kennedy, to take interest in the script, while they were filming the movie, HOOK starring Dustin Hoffman. Richard's movie career ended when he became a Mr. Mom in 1991, after moving to Salt Lake City, Utah. This screenplay, Coyote In A Graveyard, will be released in 2011 for your enjoyment. Shaolin Film has become the library of Richard Del Connor's photography and cinematography works from 1969 to 1999. As a photojournalist of Newspaper Guild 69, in Los Angeles, California, Richard shot rock concerts and album covers with his 35mm Nikon Nikkormat camera he inherited from his uncle, the founder of "environmental biology," Richard E. Warner. Richard Connor was named after his uncle and up to the age of 16 was planning to follow his uncle's footsteps as a marine biologist in San Diego, California. A marijuana trafficking conviction altered these academic plans when Richard was deported to St. John's, Newfoundland in 1970. During these turbulent years, Richard sought peace of mind by studying various religions and philosophies by authors ranging from the Old Testament to Machiavelli. Also pursuing science and physics, Richard realized he'd become a Buddhist when he was engrossed in his Kung Fu and Tai Chi training at the Tai Mantis Federation, in Torrance, California, in 1982. By 1992, when Richard was hired by Utah Governor, Michael Leavit, he had become a full-fledged Shaolin Kung Fu master, teaching his interns, neighbors and friends. Shaolin Chi Mantis was founded in 1992, after being hired by Utah Governor to teach at the Decker Lake Maximum Security Prison. This Kung Fu school was comprised of the three primary Kung Fu styles Richard molded together: Northern Shaolin Kung Fu, Yang Style Tai Chi, and Northern Praying Mantis boxing. 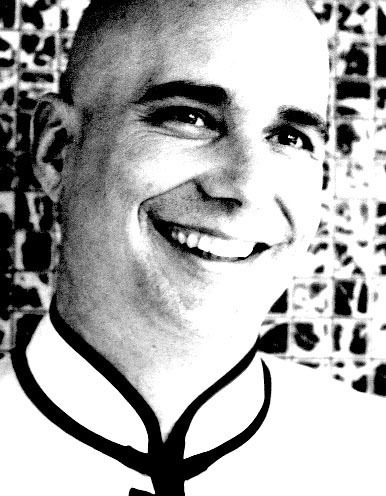 Now, an established Zen Buddhist, Richard also blended his religious beliefs and Buddhism into these curriculums. The "disenfranchised Mormons," of Salt Lake City, were so fond of Richard's Buddhism, that he was coerced into creating his own sect of Chinese Chan Buddhism, Shaolin Zen, for those Utahns, less interested in his Kung Fu and Tai Chi classes. During these early years of Shaolin Chi Mantis, Richard Del Connor, then known as Richard O'Connor, began storyboarding his first Kung Fu and Tai Chi videos. Refocusing his Hollywood movie career dreams on these instructional videos led to scripting of the 88 Dharma Trails of Shaolin Chi Mantis. Some of the photos used in these websites, including the album cover photography of the TAI CHI MAGIC 1 cd, are the production stills from this planning period. In 2000, Richard Connor / Master Zhen, moved back to California, eventually relocating to his home in Tujunga where he was bitten by a large female black widow spider* that crawled up into his swimming shorts. Trapped within this underwear webbing, the spider bit him numerous times resulting in swollen feet so large that his toes were not visible. Perhaps anyone else would have died from such serious poisoning. Richard could not walk for weeks, and it took several months for him to be able to walk one mile to the store. Richard's common-law wife was living with her new fiancee and somehow Richard was able to maintain his Mr. Mom career with only a few weeks of interruption, and not owning a car. *note: American Zen's upcoming album, LEVEL 4 = Kung Fu Cowboy PART 1, includes the song, "Kill The Spider." Check out this song and follow the "8 Level Buddhist Journey," of American Zen. By 2003, Richard, Master Zhen Shen-Lang, "Spirit Wolf of Truth," was back on his feet teaching Tai Chi classes at the LaCanada YMCA. However, for the first time in his life, due to his inability to walk and exercise, Richard had gained 55 pounds, giving him a total weight of 235 pounds on his 6'1" body frame. Richard lost 10 pounds with the addition of this first weekly class. The following year, Richard added the Shaolin Kids programs to his schedule and lost an additional 10 pounds. By the time he had added the Taiji Seniors, Taiji Teens, and Tai Chi Kids programs he was back to his original healthy weight of 180 pounds. This proved Master Zhen's theories about his Kung Fu and Tai Chi programs being useful for weight loss and obesity, as he never changed his diet during these years. When Master Zhen reached five hours of of his Shaolin Chi Mantis classes per week, he had lost 50 pounds = 1 hour per day / 5 days per week of his Shaolin Chi Mantis Kung Fu and Tai Chi for a healthy body. Other obese students would also prove this to be true over the next few years. In 2008, Richard became known as, "Buddha Zhen," an upgrade partially due to his utilizing his own self-help website, actZEN.com. Buddha Zhen followed the instructions of this Buddhist self-development website he had created and discovered how beneficial and enlightening it could be. Weekly radio show podcasts of Coyote Radio .NET, the "American Zen Buddhist Rock Podcast," detailed this spiritual development as Buddha Zhen, known as, "The Coyote" of American Zen, diligently analyzed himself and reconstructed his personality. As a result of this actZEN.com website, Richard O'Connor was transformed into Richard Del Connor; The Coyote was transformed into The Hippy Coyote; and Master Zhen became Buddha Zhen. Listen to these 2007 podcasts for intimate details of Richard's psychological transcendence. In 2009, Buddha Zhen's newest Kung Fu school, Buddha Kung Fu, launched a special Kung Fu program for Americans without time to visit their Kung Fu school several times per week: the 12 Step 12 Week Kung Fu Bootcamp. These classes are proving to be accessible and worthwhile for working parents who can only visit class once per week for one hour. The additional 4 hours per week required for ultimate health and fitness are the homework that students can easily pursue wherever they work and live. In 2010, Buddha Zhen is launching the ONLINE KUNG FU and TAI CHI programs of shaolinINTERACTIVE.com which brings our hippie Buddhist full circle back to his motion picture dreams as he directs the 66 videos of Shaolin Interactive, that will lay the foundation of his yet produced, 88 Dharma Trails of Shaolin Chi Mantis. Students and persons worldwide are now purchasing and downloading the BUDDHA KUNG FU STUDENT MANUAL created for the launch of Buddha Zhen's Buddha Kung Fu schools. This interactive spiritual warrior book is another way that Richard is reaching out with his goals of improving the world. 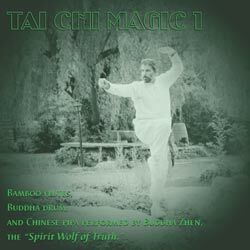 Back to being a record producer, Shaolin Records released TAI CHI MAGIC 1 by Buddha Zhen. This record album of songs written and performed by Buddha Zhen, is also being purchased by people around the globe. This worldwide audience of Buddha Zhen had over 3,000 fans a month downloading his Zen Buddhist Podcast of Shaolin in 2009. So shaolinZEN.tv is establishing itself as a worldwide multimedia outlet for the Zen Buddhism, Shaolin Kung Fu, Yang Style Tai Chi, World Music of Buddha Zhen as he reaches out to the world and improves the lives of as many people as possible.